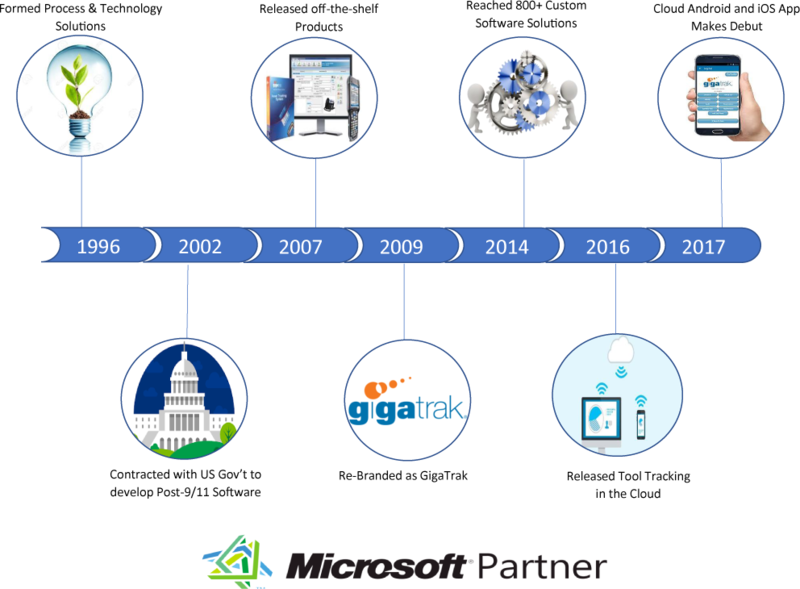 GigaTrak (formerly Process & Technology Solutions) was established in 1996 and has written over 800 unique software systems. Ranging from off-the-shelf to customized software, our solutions meet a wide variety of customer needs. Our clients vary from small, independent entities to Fortune 500 corporations, government agencies, and the military. Our services track company data and investments, which in turn reduces operating costs for our customers and aids in the success of their business. During the last several years, GigaTrak has developed numerous “off-the-shelf” products for companies of all types. Each product is designed around a standardized user interface to ensure ease-of-use for our customers. The user interface includes functions such as user authorization, bar code label designer, PDF report creation, default report and label printer assignment, and more. Our “look-and-feel” is user-friendly and keeps training time at a minimum. GigaTrak is committed to delivering superior barcode-software solutions that meet and exceed the needs of our clients. By evaluating individual situations, personalizing two-way communications, and building solutions specific to your needs, GigaTrak has taken a unique approach to reaching excellence in the software industry. Quality—GigaTrak uses industry standards when building off-the-shelf and custom solutions to ensure that you can use them both now and in the future. In addition, our solutions undergo several rounds of testing to guarantee that the software will function properly once it’s in your hands. We promise to take responsibility for delivering only software of the utmost quality. Commitment—GigaTrak remains devoted to the people it serves. By constantly treating people with respect, we create meaningful, lasting relationships with our customers and employees. We promise to listen, understand, and constantly delight our customers while building trusting partnerships throughout. Flexibility & Innovation—GigaTrak aims to find solutions that meet and exceed the needs of our customers. Though many of our applications are Windows-based and use certain databases and interface systems, our team is dedicated to creating a solution that works for your evolving needs. We promise to continually grow and change our thinking to achieve your goals and ours. Integrity—GigaTrak holds itself to ideals and values that go above and beyond. Our company acts ethically in both words and actions, conducting ourselves with the highest of standards. We promise to always be honest and act in accordance with our beliefs and principles. Cost-Effectiveness—GigaTrak strives to bring you superior solutions at reasonable prices. Whether purchasing an off-the-shelf system or customizing software, our prices are designed with you in mind. We promise to give you only the tools you need to succeed with our systems; no more, no less. Arising from different backgrounds, and utilizing several different talents, our team works together to bring you superior solutions that meet and exceed your company’s software needs. Our hard work and personal commitment to success help to drive our company forward and meet your expectations. GigaTrak prides itself on providing our customers with an outstanding experience 100% of the time. By choosing GigaTrak, customers can rely on the services we provide and trust that those services will be executed to a level (of performance that is) beyond their expectations. Process & Technology Solutions, Inc. is an Equal Opportunity Employer that vales diversity. All employment is decided on the basis of qualifications, merit and business need. Installation and maintenance of software. Computer services, namely, technical management of information technology systems of others in the nature of computer networking systems and software. Training and seminars in the fields of inventory management systems and equipment, bar coding systems and equipment, data collection systems and equipment, data communication systems and equipment, networking systems and equipment, and software.